Would you recommend Wifilist to a friend? I like the simplicity of this and perfect for nomads (see @levelsio's collection here). Where are you getting this data, @atudotio? I pulled a list of WiFi locations nearby. It worked great but I know for a fact that Capital One 360 Cafe's broadband speeds deteriorate mid-day when they're busy. Maybe there's a way to communicate this or in a perfect world, show the current expected speeds. Thank you @rrhoover ! 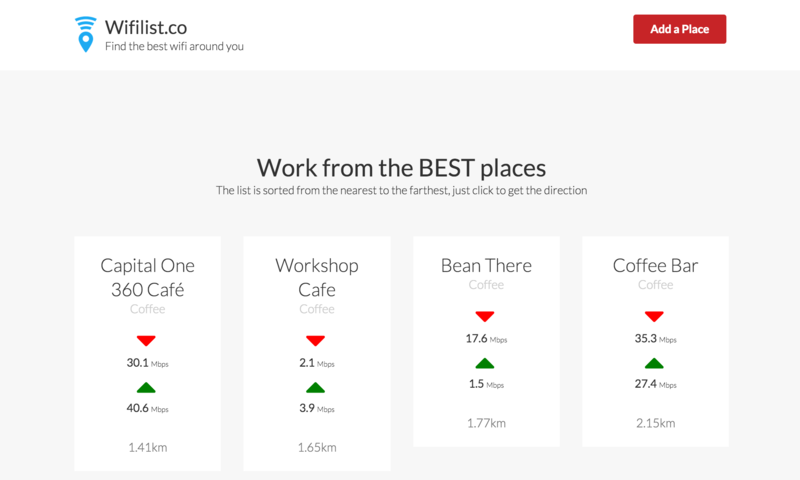 I'm getting data from people and I'm asking the owner of each coffee place to make a speedtest and send me the result. Nice idea for the current speed. In the future I will get my own speedtest. @atudotio my pleasure! I agree w/ @rrhoover here on simplicity. I like that I'm able to see a list of places right off the bat without entering my location. Nicely done. @jonbstrong Definitely something that I will do. Is the app still working, or just temporary down ? I get a " this site can't be reached" error.